Robert Earl Sutter III, Hobo Fires. Self-published, 2014. Pp 336. ISBN 978-0-692-20603-4. $30.00. The universe began when a flood burst thru a dam. Matter flowed forth. It was darkness. As the flood matter it also coalesced & became the stars & planets & galaxies. You can still see the flow today in the way that galaxies are strung together across the universe. Or in the flowers on a tangled vine. In 2137, hobos have evolved, just like the rest of the world. The characters in Robert Earl Sutter III’s graphic novel Hobo Fires have hacked a system that is made to entrap them into a life of drudgery and unquestioned consumption. The main character, Poenee, hitches rides on robotic freight trains with a smartphone-like technology that seems almost as good as a sonic screwdriver. Railroad bulls and many police officers have been replaced by androids. Surveillance technology has been fully incorporated into society. She meets a number of people on the road, most importantly Raukkus, a fellow hobo who becomes her companion. Hobo Fires is many things: a tiny story in a huge cosmos; a sprawling road narrative; a graphic exploration into philosophy and physics; a love song to both individual rebellion and to the powerful collective. Poenee and Raukkus journey across the country, encountering squatters, aliens, tornadoes, androids, and witches. Rather than unfolding according to traditional plot structures, Hobo Fires explores ideas and cosmic connections. It’s cut from the same fabric as Zen and the Art of Motorcycle Maintenance and On the Road: the characters move from one place to another, discussing love, the magnetosphere, the universe, survival. There’s not really a plot, beyond that, or much of a sense of conflict—aside from the nebulous struggle against “the tools” or “the system.” Raukkus is a former convict with a court-mandated chip in his head, and he and Poenee journey to Minneapolis to have it removed. But this plot point is brought up 100 pages into the 300 page graphic novel. It’s resolved by page 200; the last third of the book follows Poenee and Raukkus and a new friend, Booska, as they form a band and tour around the country. This is not so much a chronicle of a journey, since that would imply that the characters (and the story) have a destination. There’s no “there and back again” in this graphic novel. The story ambles along, and when it finally takes its leave of us, the audience, it tips its hat and moseys off into the sunset. The art in Sutter’s graphic novel is similarly hard to categorize. The landscapes are wonderful: well-composed, highly textured. Similar attention is paid to portraits of animal and plant life. Sutter’s portraits of people are best when they’re treated the same as his landscapes: there are a series of close-ups in the beginning of the books that are fantastic. Later in the book, the group encounters a group of feral “oogles” in the forest; the full-body drawing of a naked oogle with the words “BORN TO DRINK” tattooed on his gut, throwing a bottle and shouting “Kill!” is grotesque and amazing. However, it’s one of the few moments of true dynamism in the book. Many of Sutter’s figures seem pasted onto their background. Most of them seem stuck in a single expression of vague wonder and excitement. Much of Hobo Fires is light-hearted, and occasionally verges on twee. The political roots of the DIY punk movement that’s depicted here (remarkably unchanged, 100 years in the future) have mostly been removed: the book instead depicts a culture that’s largely removed from the vaguely oppressive system, and seems unaffected by it. Though Poenee and Raukkus both condemn the society that they’re rebelling against, their choice to go off-grid focuses on personal alienation and resentment towards their parents. “Society” comes across as an extension of parental authority. One of the problems with the philosophical investigations in Hobo Fires is that none of the ideas are debated. There are no counter-arguments, no explorations, no conflicting opinions. Everything is presented as cosmological truth: we get an answer without the equation, or the logic behind it. Too much is taken for granted, and everyone nods along. There are places where the lack of intellectual rigorousness is really apparent. In one passage, about halfway through the book, just after Poenee and Raukkus survive a tornado hitting the town they’re squatting in. Sitting in another train car, Raukkus asks Poenee why they she think they’ve survived. Because that’s what we do. That’s what every animal alive in the world is doing. The reason our genes were passed on is because our ancestors were survivors. The other fools are dead. We survived because we are fortunate bad asses in the right at the right place and paying attention… The difference is they were wage slaves focused on performing their function and staring into screens for relaxation. Their instincts and intuition were so dull they couldn’t sense the approach of death. So they died. Now, this could have been an interesting place to explore survivorship bias, or the intersections of poverty and natural disasters, or pretty much anything. Instead, Raukkus just replies, “Harsh. Let’s have a drink.” Honestly, I would have found these characters, and their story, much more interesting if they had disagreed with each other sometimes. This conversation reminded me of the many smugly superior college-age anarchists and libertarians I’ve known: distilling the world into simple ideas that reinforced their own self-righteous attitudes. It left a bad taste in my mouth. This isn’t to say that I disagreed with all of Sutter’s political or philosophical conclusions. In fact, Hobo Fires made me feel intensely nostalgic, and sometimes very happy. It reminded me of how much I loved the radical communities I’ve been part of. The self-sustaining social bubbles of punks, radical queers, anarchists, and artists were, at the time, healing and nurturing—in the same way that they are for Poenee and Raukkus. In the end, though, I also found these communities and their ideas both limited and limiting. This makes it difficult to read Hobo Fires with an objective eye; it’s possible that I’m projecting all my frustrations with young American anarchists and back-to-the-land radicals. 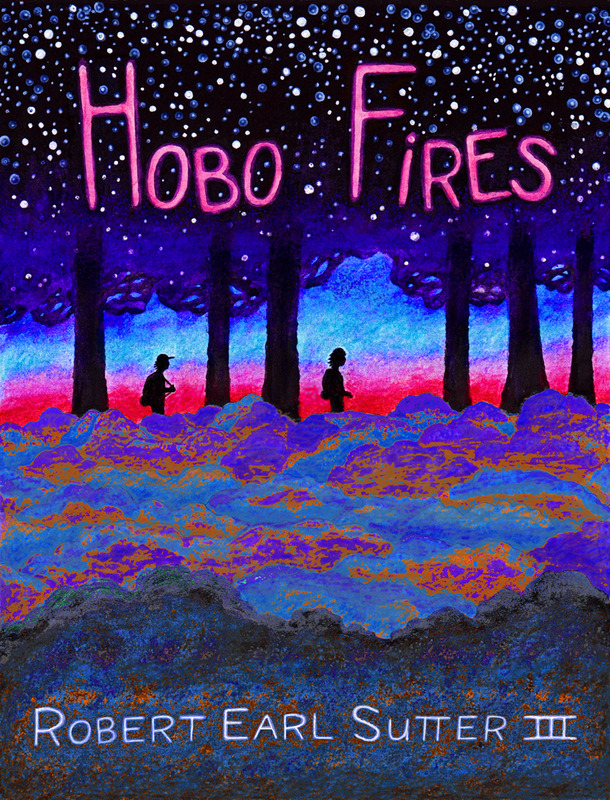 At its heart, Hobo Fires is like a fantastic drunk conversation you have at a crazy party in your early twenties; the conversation that makes you feel like you know everything about the person you’re talking to, and always will. The conversation and how it made you feel—young, invincible, full of energy and poetry—will stick with you. How enlightening the words themselves actually were is a matter of reflection.